- Device system. You can now craft and equip different devices that will give you some special abilities in certain situations. - Energy system for devices. You can now equip powerbanks that will provide power to other devices and energy weapons. - Implant system. You can now craft and use different implants that offer your character different abilities or improve certain stats. - Digital signs that can display images (later you will be able to draw your custom images too). - Cybernetic medical stations - you will be able to install different cybernetic implants here. - Pragmium mineral source - new mineral type found in the desert. It is a major part of gameplay in CryoFall now, but we won't spoil how it works - find out for yourself! - Energy weapon system - now we can add weapons that use energy instead of ammo. With this update we added several laser and plasma weapons you can unlock and craft. More to come! - Animal corpse looting - spoils won't just spill on the ground now. Hunting skill receives some experience for this action. - Technology tree now has icons for all tree nodes making it easier to see each individual technology. - New safe item storage inside the land claim structure. It will keep your items safe as long as the land claim is not completely destroyed. The items will be dropped upon destruction to ground and stored there for 24 hours. - Blueprint placement continuous mode implemented for walls, floor and farms - hold LMB and move the mouse cursor (or move yourself) to place these blueprints (no need to click every time). - Improved defense bars in inventory window to clearly communicate the defense value of the equipped items. - Land claim "Upgrade" button tooltip added to let you know about the stats of the upgraded land claim. - Expanded and reworked the world map. - Device: Biomaterial collector - allows to collect "biomaterial" from killed creatures. - Added special hygroscopic granules that make it unnecessary to water plants when applied to the soil. - Several new quests + reworked existing quests. - New area in the desert: salt flats. - New salt mineral (source of salt but also contains small quantity of lithium salts sometimes). - Five cybernetic implants you can craft and install on the new medical station. - New tropical trees and fruits (e.g. durian tree). - Mining charges - it can be used to quickly mine large area, but requires resources to craft. - New alcoholic drink: tequila. - Cooking table with half a dozen new recipes such as sandwich or fruit salad. - New props (decorations) such as roads and road signs. - New skills: Cybernetic affinity. - Armored safe - to store your most important valuables. - Trash can - to store your most useless items . It will dispose of them instantly. - New tech groups: energy weapons, cybernetics, industry 4, medicine 3, farming 3, chemistry 3. - Structure decay delay increased to 32 hours (was 24 hours) as most players cannot come back to play at exactly the same time. - Improved item placement when you try to drop them on the ground. Now it makes a bit more sense as it allows to place an item anywhere inside your interaction radius. - Now you can't plant seeds inside rad towns (duh). - Construction sites (blueprints) now have only a fraction of durability of fully built structures, especially walls and doors. Make sure you complete them as soon as possible. - Fixed healthbar craziness when there many damaged structures on the screen. You will now see them in a radius around your character. But you can still see all if you press "Alt". If you point over a damaged structure it will reveal the healthbar as well. - Some players developed a bad habit or kicking every door and wall so a threshold was added to ensure that the healthbar will not appear over structures with >98% durability. If you ever want to reveal these little scratches - the "Alt" key works here too as well as pointing over the damaged structure. - Construction site (blueprint) progress bar is now hidden by default. But it is displayed as normal when you're pointing your mouse on it (needless to say, "Alt" key works too). - No need to hold right mouse button to interact with world objects - just click it and it will work automatically. To cancel, click again or move your character. - Reworked batteries: there are now two types. Both work exactly the same, but give different amounts of energy. - Changed prices and recipes for many items. - Completely reworked all technology trees. - When you die your character will receive "Weakened" status effect - this is mostly to prevent people from abusing respawn mechanic to loot radtowns naked. - Many items have been rebalanced or their effects changed. - Reworked ammo and weapon balance (e.g. automatic weapons are not so overpowered now). - Rebalanced LP gain. Now you will gain slightly more LP in the beginning of the game, but as you advance your skills you will get slightly less LP to account for increased efficiency for each particular action. Plus removed several points of abuse to quickly grind thousands of LP. - Bandage now also gives small health regeneration bonus to make it more useful. - Removed unused items and objects from the game to reduce the size. - Rebalanced most skills and implemented all remaining missing effects. - Basic land claims destruction timeout has been increased (especially for the lower tiers, T1 is now 24 hours). - "Clear list" button was added to the "favorite" and "recent" server lists. - Destroyed weapon will unload remaining ammo as an item, so it isn't wasted (thanks @Djekke). - Proper explosion damage propagation algorithm (which allowed us to increase the explosion damage distance). - Cigar "high" status effect rebalanced (thanks @Samir). - Eating Rustshroom will cause nausea for 5 minutes instead of 10. - Now you can't build land claims which will cover/intersect the grace area of another land claim unless you're in the access list of both land claims. - Equipped armor destruction on death will deduct 10% durability measured from the max durability value instead of the current durability. - Players in creative mode can deconstruct any building anywhere with the crowbar (useful for OP of private servers). - Better reporting when there are not enough items to craft the selected recipe for campfire and other manufacturers (previous it was reported as "Input items doesn't match any recipe"). - Toggle run mode should persist between game sessions (thanks @Samir). - Cascading land claim decay reset implemented - all nearby land claims will be reset from decaying if you're visiting at least one of them and you're in their access list (thanks @Samir). - There were no deconstruction sounds, so for now we are reusing construction site sounds. - Enabled auto-flipping for some props sprites to increase variety. - Using Reflection API in scripting is forbidden now for security reasons (mods should use TypeExtensions as a replacement). - Recipes and technologies were refactored to derive their names from items and buildings automatically. This will help with the localization in the future. Some duplicate descriptions for items and buildings have also been improved. - Now hand-crafting recipes could define optional list of crafting stations where they should be displayed in the recipes together with the station-only items. - Improved console help command to list all the console commands with their detailed descriptions. - Adjusted collision boxes for trees (it was hard to hit them with an axe, especially tropical trees). - FMOD (Sound System) updated to version 1.10.07. - Various performance optimizations and improvements for both client and server. - Now no extra permissions from the OS are needed to launch the game (no UAC pop-ups). - Spawn areas were incorrectly processed resulting in inconsistent spawn when the required padding between certain objects was ignored. - Long-lasting issue with error in console (dev mode) when another player is hitting an object with weapon and this player is not in your scope. - Proper movement smoothness for observed players and creatures (movement choppiness was noticeable on servers with the tickrate below 60 FPS). - Game processed keyboard and mouse input in unfocused mode if it was started this way (e.g. Alt-Tabbing right after launching the game). - Item container sorting was executed (and caused client hiccup) even if the items were already in order. - In some rare cases the game was unable to discard/revert the input options changes and stuck in never ending dialog windows loop. - Crash when failing to initialize FMOD (Sound System). - Stale servers in the servers lists (now Master Server is able to properly handle half-opened TCP connections to detect these dropouts!). - This is a public test version of A17. The server hosting this version will destroyed with the full A17 release and all the game servers will be wiped and updated to final A17 release! So, it is time to work on this little FAQ to address most common questions that people are asking. If you have any question that you think would be a good addition to the FAQ - please post it here and I will include it in this post. Yes. You can deconstruct any building/structure inside your own land claim by using a crowbar. You will not get any resources back. Yes, you can cancel any blueprints by just holding the right mouse button over them. They don't even have to be on your land claim. You will get ALL resources back. What do land claims do? Are there any advanced chat commands? Are there any points of interest on the map? Yes. There are many abandoned bases which can be explored for loot and rare items. It is protected by relatively strong monsters and also has radiation, so you might want to grab some appropriate protection and weapons. I'm trapped/stuck! What can I do? You can use "unstuck" command. To access it you can open your inventory and simply press the "Unstuck" button. You will have to wait for 5 minutes though without moving. This is to prevent abuse of this feature. - New boreal forest biome with all new vegetation, monsters and resources! - Explosives! For now we have added bombs specifically designed for raiding, but we will introduce more explosives (and new wall types) in the next update. - Ambient sound system (game environment now feels much more alive!). - New loading and splash screens. Looks much better, right? - New weapons and related items: .300 heavy rifle, machinegun and .300 ammo. - New structure: fermenting barrel to produce alcohol. - New sound effects for new and existing game content and features. - New night vision helmet with green night vision effect. - Completely new visuals for all trees, bushes and mushrooms in the temperate biome. - New droplist system - now you can be sure that loot in radtowns will be more consistent. - New bricks floor (brick wall will come later too). - New coal mineral node that can be found in boreal biome. - New tech groups: offense 3, offense 4 and recreation. - New glow in the dark mushrooms (don't eat them ). - New frame limit option: screen refresh rate. - FMOD integration - much better sound engine which will also allow us to use DSP effects in the future (such as echo, reverberation in caves, etc.). - Significant balance changes to many aspects of the game. - World object spawning now uses local density which drastically improves spawn consistency and ensure no resources will be depleted even if they're mined regularly. - Respawn algorithm for players have been significantly improved. Also the spawn areas are modified to ensure a more randomized initial spawn. - Quests menu will now have visual indication to show when a quest is completed or unlocked. - Quests now track certain actions even if you haven't received the quest yet. Meaning that you won't have to do certain things twice. - Walls have been rebalanced to accommodate introduction of explosives into the game. - Rebalanced all tools: now better tools offer much higher efficiency when mining/cutting, while skill effect have been reduced accordingly. - Improved terrain decals system. - Land claim areas now are always visible/highlighted in the structure placement mode. - Dropped items after dying will now lose 10% of durability, rather than 30%. - Much improved performance and overall gameplay smoothness. - Ranged weapon attack vector precision improved. - Game builds now use CPK and MPK format for game data (same as in our previous games) which improves loading and installation time significantly. - Improved torch/lamp character animations. Also the torch fire position is properly animated. - Fullscreen mode is now used by default. - Radiation sound effect have been made quieter so it doesn't overpower everything else. - Improved inventory shortcuts (e.g. when Shift-click moving items between containers you will never have an item moving to an unexpected destination such as your hotbar). - Texture preloading. This ensures that certain visual effects won't be rendered with frameskipping (e.g. muzzle flash & explosions). - Added a few minutes pause between the music tracks, and a slow fade-in fade-out effects - so it will be not so intrusive. - Wolves and boars were nerfed a bit to make them easier to avoid/kill by the new players. - Randomized tree scale (+-15%) to add more variety into the forests. - Now seeds only can be placed in tiles nearby the character. - Multitude of other improvements. - Fixed many typos and incorrect text in descriptions. - Fixed campfire and other objects consuming fuel even if their output stacks are full (don't waste the fuel!). - Fixed "Use mulch" quest requirement cannot be finished. - Fixed AI creatures zig-zag movement. - Move animation speeds adjusted for several creatures. - Shadows adjusted for several creatures. - Moved the Toxin recipe from Laboratory to Medical lab (as it should have been). - Equipped armor will now only lose 10% of durability on death (previously it was set to 90% by mistake). - Invisible player's corpses will no longer create a problem for construction (thanks @p0ki for reporting). - Walls, doors and land claims are all generally 2X stronger then before. Certain other structures have also been adjusted slightly. - Price to craft explosives have been increased to be 2X more expensive (with other slight adjustments). - Blast radius for advanced explosives (bomb) have been reduced. - Fixed bug: it was possible to place explosives through the door. - Fixed bug: it was possible to build structures in the top right corner of the lithium deposit. - Fixed bug: if number of players in a land claim or door was too large it broke the UI formatting. - Fixed bug: infinite "Game cannot compile" dialog message boxes spamming with editing scripts. - Maces rebalanced: dazed special effect duration increased to 3 seconds, chance increased to 6% and 7% for Copper and Iron maces resoectively. Attack animation/interval now 33% slower. - Improved player (re)spawn algorithm to ensure the better spawn position (less probability that a player will respawn in a non-claimed walled up area). - Players won't respawn in the bed if the area around it is claimed by another player. - Bear loot adjusted to be more consistent (thanks @Evil Mammoth). - When attacking any structure with fists it will deal zero damage (thanks @Djekke). - Physics de-stuck algorithm implemented to ensure characters won't be stuck in another physics body. - Berry pie recipe requiring 5 ingredients but Oven has only 4 ingredient slots (thanks @BobTheFish). - Special effects (such as bleeding and dazed) were not applied to creatures. - Rare issue when player's character couldn't move after the respawn in bed. - Loot sometimes not dropping from a dead player (thanks @z00nk). - Sound volume option was not working properly (even with volume set to zero player could hear all the sounds as usually; thanks @APXEOLOG). - Crafting queue displaying an "empty" recipe on reconnection (thanks @Evil Mammoth and @Daitallica). - Barely noticeable color banding ("16-bit color") in night around the light sources. - Live recompile crash in certain conditions (thanks @Djekke). - High CPU usage after long server uptime which required regular server reboot. - Stumps and fallen trees were playing "falling tree" sound on destroy. - (Steam version) the game will ignore screenshot key (F12) to ensure there is no conflict with Steam Client screenshot feature. It's still possible to rebind the screenshot key to another key and use in-game screenshot feature (thanks @Kane Hart). - Problem when opening an interaction window (RMB click) and item stack is under the just opened window - sometimes item was taken automatically in the hand (thanks @Evil Mammoth). - Fixed bug when the bottom right corner of the map was uncovered for the dead players (unfortunately the fix will apply only to the new characters). - The game server runtime is ready and we're planning to release it very soon as we finish the documentation. - Now mining and woodcutting experience is added proportionally to the structure points of the object (for example, regular iron mineral will give 120 XP total as it has 1000 structure points, but sand pile will give only 30 XP total as it has 250 structure points). - Door auto mode will not consider offline players. - Post-effects checkbox is removed from the Debug tools overlay (it will be available in the Editor game version only). Please don't use the developer mode (unless you're a modder and require the debug experience). - Meat & Mushrooms stew recipe requiring 6 ingredient slots but Oven has only 4 ingredient slots (thanks @Sarai0989). - Major performance drop with the land claims visualization (very noticeable when building/destroying on the EU server). - Properly restore the time continuum after loading the server snapshot/savegame (bug with the incorrectly long plant growth time after server restarts after a patch, also bug with the berries growth duration). - Items desync: when a manufacturing output item is moved from the output slot while its count is incremented on the server side (thanks @Daitallica). - Exploit introduced in the 0.15.5 when players were able to push each other through the walls. - When disconnecting from the game server during the world map loading in background, it spammed errors in the console. - Object owners list UI: adding a new user right after construction of certain objects (e.g. door or land claim) led to an issue when the creators username displayed twice in the owners list. - Completely new quest line with more than 30 quests. - New items: miner helmet (with light! Tier 2 Defense tech) and yellow construction hat. - New industrial crate that can be found in industrial ruins. - New types of quests. - Rebalanced a lot of technologies, especially tier 1 & 2. - Significant rebalancing of almost all weapons and ammo in the game (both stats and crafting costs). - Updated quest menu, now shows number of quests available and completed. - Improved client movement and lag interpolation & prediction in connection with stamina (no more pullback when you're running and your energy depleted). - Lamps in auto mode will now only use fuel when there are players nearby (and they're online). - Rebalanced certain enemies, especially Scorpion. It now has substantial armor and it's better to use armor piercing rounds or heavy slugs against it. - Improvements to certain notifications, error messages and other popup windows with information. - Fixed lamp/flashlight recharging bug when the fuel/battery amount didn't changed on the client side. - Fixed random nausea when drinking pure water. - Fixed incorrect amounts in item notifications under certain circumstances. - Other small fixes & improvements. We are also looking forward to your YouTube videos and specifically let's plays as well as Twitch streams! - New items: industrial chemicals, new bottles with water (salty and stale), etc. - Improved server performance so you should experience smooth gameplay even if there are hundreds of players. - Credits updated and now includes the list of used technologies. - Fixed incorrect door orientation detection when building a door near an another door. Game discussion / Balancing food, freshness and fridges. I saw many of you say in the game chat that fridges aren't particularly useful and that food still rots. Well, that's to be expected as adding food that never spoils is bad for game balance. Especially considering that it's already quite easy to obtain food and water. But still, I would like to better balance this system. I will probably bump it to 1.5h, 4h, 8h and 2.5d to make it slightly more convenient. Now, about fridges. They slow down freshness decrease by 10 times. I think it is quite a substantial increase. But if you log our and login the next day and your food has rotted away in the fridge I can see how fridge can feel a bit useless. But increasing it further, more than 10x would introduce disbalance. Anyway, before I make final changes I'd like to hear what you think. Maybe there's a better way to fix it? Game discussion / We need your videos! Please post your let's plays. Now that we have finally launched CryoFall publicly we would like to see as many people play it as possible! And so far feedback seems to be quite positive. There is one issue, however. There aren't many videos about the game and it is actually a problem. Usually we use those let's play videos to investigate typical play sessions and adjust the game to make it easier to understand, easier to use and generally better. But without those videos we simply have no source of this information. So, if it's at all possible - please consider recording a video with you just playing CryoFall and commenting your experience. There is not better way to improve the game than this! And thank you guys for your support! With this we feel the game is ready to fully enter public alpha and ready for large number of people to join and try the game! We will be starting with promotional activities this month, which means there should be more players now. - Completely new terrain system (with all new visuals). - Complete reworking of the biome system along with new biomes: wasteland, meadows, ruins, etc. - New metal armor set (in "medieval" style). - Huge number of new technologies and technology groups. A lot of existing technologies have been reworked. - New static objects: signs, large chests, etc. - Fridges to store perishable food for longer. - Commerce system. Now anyone can build their own stores (trading stations) to sell or buy items. - Item durability and food freshness system. - Inventory sorting (with middle mouse button). - New water shader with water distortions, transparency and shore waves. - New character status effects. - New lighting systems that blends several light sources correctly and realistically. - Proper handling of multiple displays. - Significant game improvements to performance across the board. - Local chat messages. Now they will be displayed over your character head as speech bubbles. You can start your messages with "!" to use it. Such as "!Local message, yeah"
- New sounds and sound events. - New map icons and improved icon scaling for larger maps. - Capture screenshot feature (F12 by default). - Multitude of other small additions. - Added help notifications to explain new players that they can learn new technologies in technology menu. - Most of the components are made craftable, although the primary way to obtain them is still looting from ruins. - All vegetation in the game have been passed through color-correction to adjust it to the new terrain system. We will still be revisiting it later, though. - Complete rebalancing of gold and currency. Gold now has wider use, but it is also not as rare as before. - Bushes and other gatherables are now more common on meadows and slightly less common in the forest. It makes foraging a bit more interesting and less random. - Now all technology groups have their own icons. Individual tech nodes are still using generic graphic, though, as we want to continue working on them for the time being before commiting to their final form. - New players are spawned with a torch to make it easier if they join the server at night. - Increased light radius for all light sources to make them more useful. - Significant improvements to UI: better tooltips, improved menus, better scaling, value interpolation for progress bars, etc. - Changed how drying cabinet works. Now it is possible to manually select the recipe. - Improvements to map editor (not available publicly yet ). - Mobs will now regenerate their HP. - Complete rebalancing of the LP systems and skill experience progression. - Improved spawning algorithm (now distribution takes object density into account). - VSync now uses native display refresh rate (especially useful if your display uses refresh rate higher than 60hz). - Other changes and balance improvements. - Fixed fists/weapons draw order. - Fixed all memory leaks. - Fixed interaction system to use universal interaction range. - Multitude of other fixes across the board. News and Updates / CryoFall Alpha Launch! We are continuing to address all of the small issues and also adding new features that are necessary for the wider release. We will still keep the game low profile for now. There are still a few things we would like to add before making any kind of promotions. - The world has been wiped. Enjoy the fresh start! * Saves ARE compatible with the previous versions! * Important! It is necessary to update BOTH clients for users and servers for server hosters. 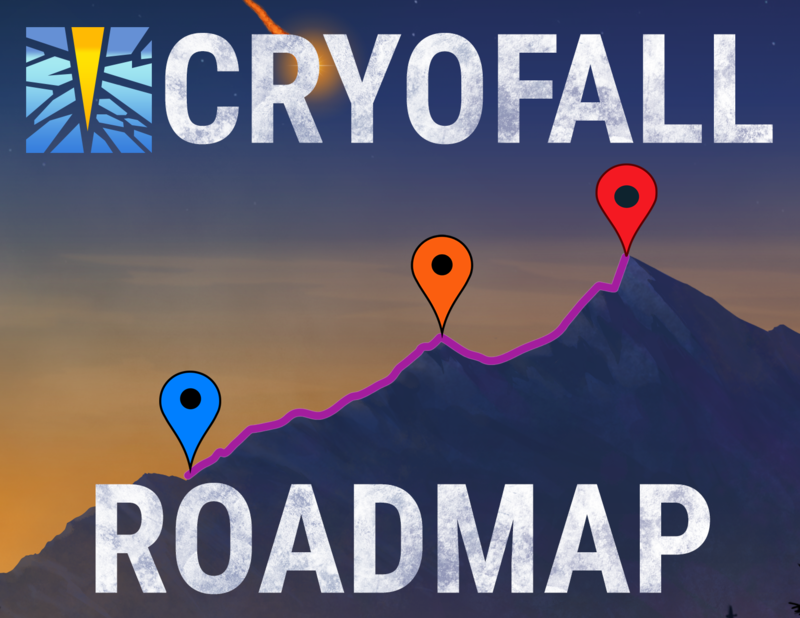 We would like to share our roadmap for CryoFall! With this game we would like to make all of our ideas, planned features and information about what is currently in progress public. You can also vote on things you'd most like to see in the game sooner. With your input we will have better idea of what's important for you. Obviously it will go hand in hand with discussions here on the forum. So you can create topics about any of the planned features to discuss them in greater details or offer your opinions. General Discussions / Anyone using discord? Anyone is using discord on regular basis? We are considering creating a server so we can join with you guys and have the possibility to talk in real time. I decided to create a new topic for this, as the old ones have somewhat outdated information, so rather than adding a ton of disclaimers and corrections everywhere, here's a new topic!